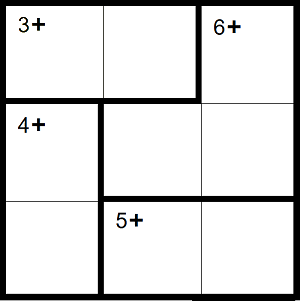 Today’s Parallelogram is dedicated to KenKen – a mathematical puzzle that is ten times more interesting than Sudoku. First of all, these are the rules. 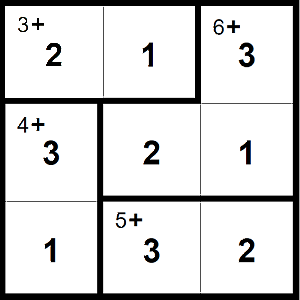 You will be presented with a 3 x 3 grid. Each row and each column contain the numbers 1, 2 and 3 once and only once. Therefore, no number can be repeated in a row or column. 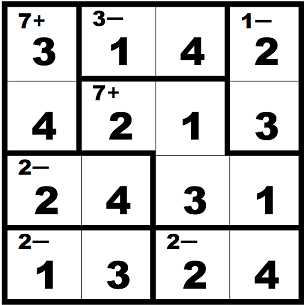 Each marked region (or cage) contains a target number and a mathematical operation. The numbers in the cage must add up, subtract, multiply or divide to give the target number. The ordering of the numbers does not matter in a cage. 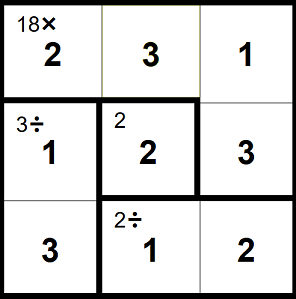 So, 2 followed by 1 or 1 followed by 2 can both give the target (1,−), which means reaching the target 1 by subtraction. If the cage contains just 1 cell, the value of the cell is the same as the target number. it is a “freebie”. 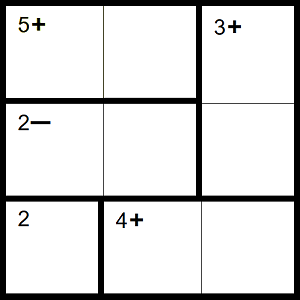 There are also 4 x 4 grids, and each row contains the numbers 1, 2, 3 and 4 once and only once. There are also even bigger grids. This video summarises the rules of KenKen. If you’re still unsure, this video goes through the rules one more time. 1.1. Here is your first KenKen. The only mathematical operation is addition. You can either copy it onto a bit of paper by hand or follow this link to open a copy of all of the questions that you can print and fill in. 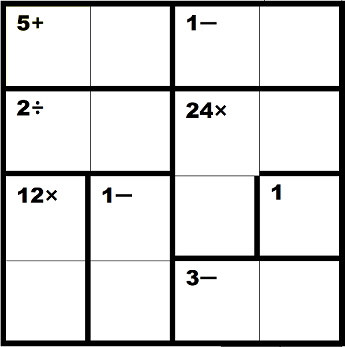 To help us check whether you have completed the grid correctly, add up the 4 corner numbers and enter the sum in the box below. The (4 +) cage is one way to start cracking this KenKen. 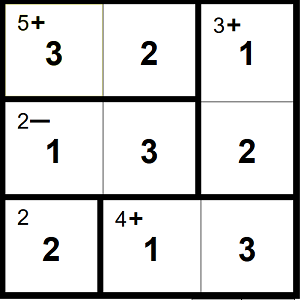 The cage has to contain (3,1), because the only other way to obtain 4 is (2, 2) and no number can be repeated in a row. We don’t know the order of the (3, 1) cage, but it tells us the remaining number in that column must be (2). 2.1. What do the four corner cells add up to? The (3 +) cage has to contain (1,2), because it is the only way to obtain 3. We don’t know the order of the (1, 2) cage, but it tells us the remaining number in that column must be (3). 2.2. This KenKen involves multiplication and division. What do the four corner cells add up to? 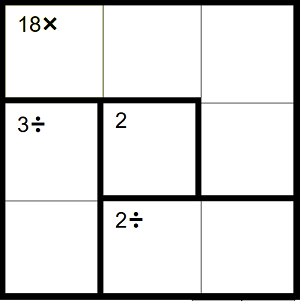 The (18x) cage has to contain (1,2, 3, 3), because it is the only way to obtain 18 by multiplying the four allowable digits. The repeated 3 is helpful, because they cannot both be in the top row, so one of them must be in the right column, middle row square. 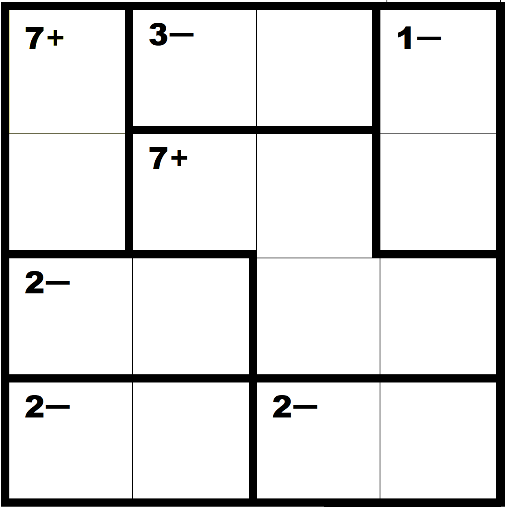 3.1 This KenKen involves only addition and subtraction, BUT it is a 4x4 grid! Focus on the (7+) cage with only two cells They can only be (4, 3), but we don’t know in which order. Focus on the (3-) cage with only two cells. They can only be (4, 1), but we don’t know in which order. 3.2 This 4x4 KenKen is even harder than the previous KenKen. Good luck. Don’t give up. There are two hints if you really, really need them. Focus on the left column. The only way to fill the (12x) cage is with (4, 3), but we don’t know the order. Next, look at the (3−) cage, which must be (4, 1), but again we don’t know the order. However, we know that (3−) cage has (4, 1), so the bottom left corner (part of the (12x) cage) cannot be 4, so it must be 3. In fact, we do know the order of (4, 1) in the (3−) cage, because the freebie (1) in the right column tells us that the (3−) cage must be 1-4, rather than 4-1, to avoid the two 1s being in the same column. KenKen® is a registered trademark of KenKen Puzzle, LLC. Copyright KenKen Puzzle. All rights reserved.